A century of whaling may have released more than 100 million tonnes - or a large forest's worth - of carbon into the atmosphere, scientists say. Dr Andrew Pershing from the University of Maine described whales as the "forests of the ocean". 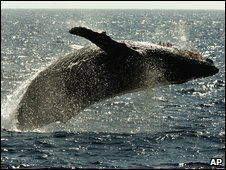 Dr Pershing and his colleagues from the Gulf of Maine Research Institute calculated the annual carbon-storing capacity of whales as they grew. "Whales, like any animal or plant on the planet, are made out of a lot of carbon," he said. "And when you kill and remove a whale from the ocean, that's removing carbon from this storage system and possibly sending it into the atmosphere." He pointed out that, particularly in the early days of whaling, the animals were a source of lamp oil, which was burned, releasing the carbon directly into the air. 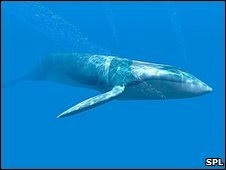 "And this marine system is unique because when whales die [naturally], their bodies sink, so they take that carbon down to the bottom of the ocean. "If they die where it's deep enough, it will be [stored] out of the atmosphere perhaps for hundreds of years." In their initial calculations, the team worked out that 100 years of whaling had released an amount of carbon equivalent to burning 130,000 sq km of temperate forests, or to driving 128,000 Humvees continuously for 100 years. Dr Pershing stressed that this was still a relatively tiny amount when compared to the billions of tonnes produced by human activity every year. But he said that whales played an important role in storing and transporting carbon in the marine ecosystem. Simply leaving large groups of whales to grow, he said, could "sequester" the greenhouse gas, in amounts that were comparable to some of the reforestation schemes that earn and sell carbon credits. He suggested that a similar system of carbon credits could be applied to whales in order to protect and rebuild their stocks. "The idea would be to do a full accounting of how much carbon you could store in a fully populated stock of fish or whales, and allow countries to sell their fish quota as carbon credits," he explained. "You could use those credits as an incentive to reduce the fishing pressure or to promote the conservation of some of these species." Other scientists said that he had raised an exciting and interesting problem. Professor Daniel Costa, a marine animal researcher from the University of California, Santa Cruz, told BBC News: "So many more groups are looking at the importance of these large animals in the carbon cycle. "And it's one of those things that, when you look at it, you think: ' This is so obvious, why didn't we think of this before?'." Dr Pershing pointed out that whales, with their huge size, were more efficient than smaller animals at storing carbon. He used the analogy of a small dog compared to a large dog. "My wife's 6lb (2.7kg) toy poodle eats one cup of food per day and my dog - a 60lb standard poodle - eats five cups of food per day," he said. "That's only five times as much food but my dog weighs ten times as much." He said that the marine carbon credit idea could be applied to other very large marine animals, including endangered bluefin tuna and white sharks. Dr Pershing said: "These are huge and they are top predators, so unless they're fished they would be likely to take their biomass to the bottom of the ocean [when they die]." The American Geophysical Union's Ocean Sciences meeting has been taking place this week in Portland, Oregon.